Oy. It's one of those weeks where I squeeze my eyes and fists (at the same time) and wish for a clone. Not enough hours. But this image put me at ease amidst my frenzy. 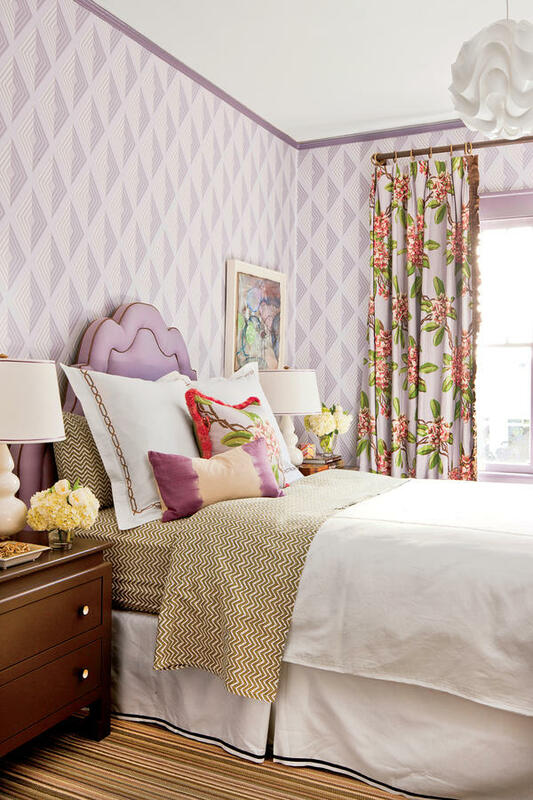 Lavender and green is high on my list of favorite combinations and I find this bedroom so incredibly lovely. I would actually never go for a geometric wallpaper like that, but it totally works with the curtain fabric. I also like that all the pretty gets anchored with khaki sheets, tailored bedskirt, neutral rug and heavy nightstand. It's what makes the whole room feel less sweet and more sophisticated. Bonus point for the painted trim and the fact that those curtains (Rhododendron by Carleton Varney) remind me very much of the print in my own dining room.